Zombie Cities is exactly as it sounds – it’s zombies in cities. It’s much more exciting than it sounds however, with more epic action and exotic locales than a James Bond film. There are seven stories within this 104 page fast paced fiction of flesh eaters, and unlike most anthologies which are filled with hits and misses, the quality leans much more on the “hit” side here. The first tale is very Australian, like the publisher Silver Fox Comics, and sees zombies rampaging across Sydney including landmarks such as Luna Park, and the Harbour Bridge. The pace is relentless as we are introduced to a cast of colourful characters including a weather girl attempting to interview a zombie, some teenagers on a disastrous night out, and a grizzled father who uses a cricket bat as a mean weapon. 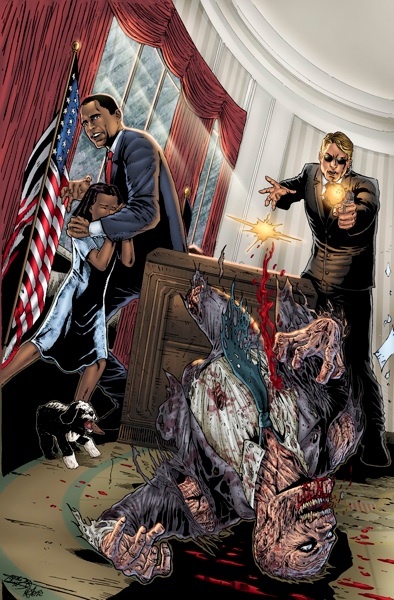 The second story is creatively titled Yes We Can Kill Zombies and is centred on President Obama and his struggles to lead his country post-zombification. It has a slower pace, but a greater emphasis on dialogue and character, with Obama taking some clear, and surprising, action in a desperate effort to unite his nation. Blood at Bondi is concerned with the return of a long missing lifesaver on Bondi Beach, and Horror at Hirajuku is madcap fun, with three teenage girls in Japan mingled with generational family issues, whacky fashion, and George Clooney spruiking an eyeball food outlet. God Save The Queen is a deliciously thrilling drama focused on the ghastly secrets of the royal family. The New York set If I Ca Kill ‘Em Here, I Can Kill ‘Em Anywhere follows the aftermath of the assassination of the NY mayor who instituted a radical law to rid the city of zombies, namely that for every zombie you kill, if there are no living relatives, you are allowed to claim their assets. Finally Voodoo Zombie Racer focuses on a reanimated racing driver in Rio de Janeiro. Sorab del Rio is the sole writer on all the offerings here, except Horror at Harajuku, which is ably co-written by Mladen Luketin. There’s a sense of madcap fun running throughout every story here with a great mix of drama, action and dark comedy and with only a few pages to set up unique characters and situations, it’s impressive that each story can stand on its own as a memorable take on this increasingly popular sub-genre. 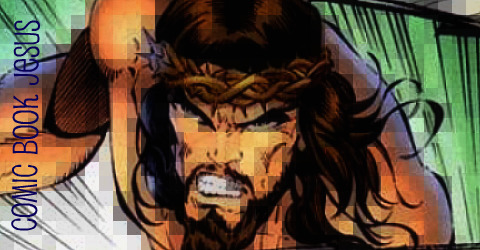 The art is, as to be expected from any anthology, a diverse offering, but the highlights are Mauro Barbieri’s slightly cartoony, exaggerated approach in God Save The Queen, and the work of Netho Diaz who gives Obama a superb likeness, and also brings detail and realism to the New York story. As a piece of design, Zombie Cities’ streamlined approach works a charm, from the hard to resist cover, to the simple, and appropriate diagrams used as chapter breaks. Rounding out this collection are some amazing pin-ups reflecting the stories in the preceding pages, and a few answers posted on Silver Fox’s Facebook page about why zombies are just so darn appealing. 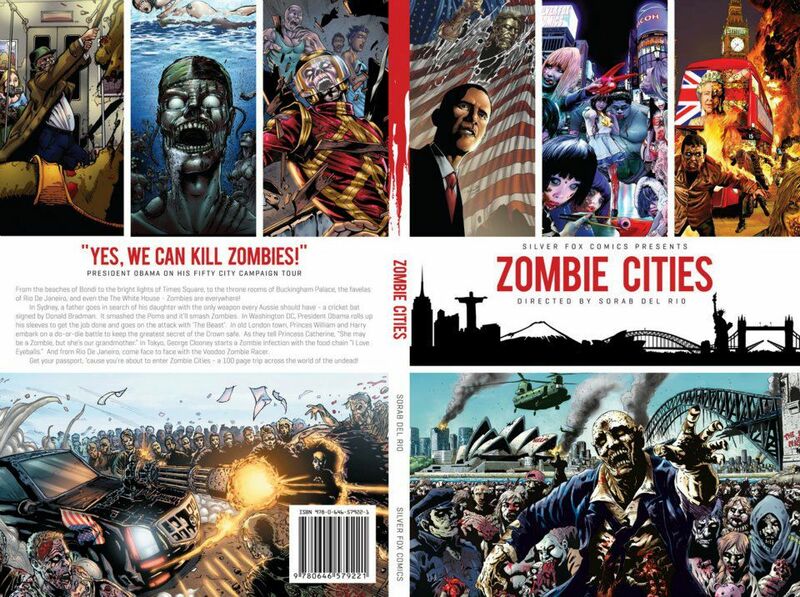 Some may expect that there are simply no more stories to be told regarding the undead but Zombie Cities proves in an entertaining fashion that thankfully just isn’t true. Zombie Cities is a full colour original graphic novel and will be available at the Supanova convention in Sydney, and at Kings Comics.